In 2006 Bonhams auctioned some sketches and paperwok belonging to the late Peter Leeming who was a bodywork designer and stylist. Herewith is a report by Steve Lewis the Historian for the Post Vintage Humber Car Club. This is reproduced with the permission of Steve Lewis………………………………………………………………………………………………………………………………. Recently, some exciting images appeared on the Club and Rootes Face book pages courtesy of his daughter, Penny Leeming. These showed several full-size mock-ups of Humber Super Snipes that had never been seen before. Photographs of development cars of Rootes Group vehicles have always been difficult to find due to the amount of material either thrown away or destroyed. However, in this case, these very rare images were now available. Contact was made with Penny, as Peter himself had died in 2004, to look at all the images. The meeting unearthed a very interesting career in the motor industry covering several iconic makes of car as well as Humber. Peter Bernard Leeming was born in the coastal village of Bovisand near Plymouth, Devon on 24 February 1924. When a little older the family moved to Buckhurst Hill, Essex and then several addresses in Middlesex, West London. Having a technical aptitude, he attended several Technical Colleges studying engineering subjects before being accepted by Rootes as a sponsored student to study Automobile Design and work, whilst studying, at British Light Steel Pressings in Acton. However, in 1956, an opening became available at Aston Martin, then based in Kenilworth and thus a family move to this town happened. It was here that he joined their design team and became involved in the development of the DB4 model which launched in 1958. Peter achieved Chartered Engineer status with the Institute of Mechanical Engineer's, Automotive Division, in 1959. Another move and promotion saw Peter move to Coventry to become involved in the design of another iconic car; the E-Type Jaguar. He produced many drawings for the design of this car which was released in 1961. Rootes and more particularly Humber now played its role by enticing Peter to join their Styling team headed by Ted Green under Ted White. As far as can be determined, he joined as the Series 5 Super Snipe and Hawk were being planned where across the Rootes range, where there was a wish to 'modernise' the saloon cars. This ended up being a new squared-off roofline above the tops of the doors, the scuttle and rear parcel shelf. This was on the Hillman Super Minx, Singer Gazelle and of course the Series 4 Hawk and 5 Super Snipe and the newly to be released, Imperial. However, it looks as if the Super Snipe/Imperial was to be given special treatment and hence Peter Leeming's involvement. 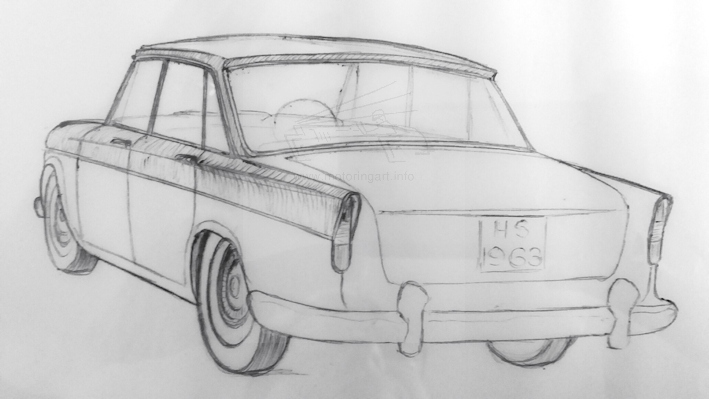 Here we think the story started in 1963 with the front nearside and rear nearside sketches which shows the elimination of the rear door upsweep, a new trim along the top of the front wings with a line through to the rear wings onto the light units. Things moved on and development mock-ups were made and thus these very rare photographs have come to light through Penny. 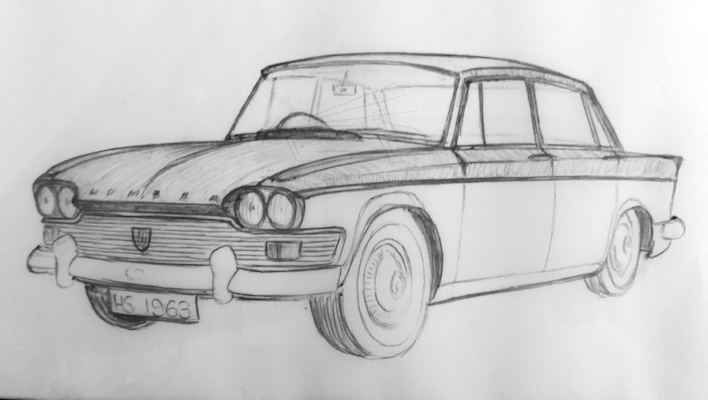 Effectively, the designs have used the basic roof line, doors but the front ends have been flattened, bonnet lines altered, a Hillman Imp/Chevrolet Corvair type bonnet with a sunken centre and raised sides. This may have been part of a Raymond Loewy influence. We are seeing a bodyside trim from the front through to a new rear light cluster and a Rapier style chrome boot lift. So, did this work? Well, we are so used to the design we know today so probably for you to determine, however, it is a fascinating ‘what might have been’! Many thanks indeed to Penny Leeming for allowing access to these unique pictures and permission to reproduce. Hopefully this article is a fitting tribute to her late father; Peter Leeming.